The name of this expensive golf cart is Garia Soleil de Minuit. The owner the the golf cart is the family of Monaco’s royal. This golf cart has front double-wishbone suspension, cooling drink box, and painted with the colors of consumer choice. The most special about this golf cart because it was created by the maker Porsche Boxter and Cayman, assembled in Finnish, gearbox was made by companies that produce Ducati gearbox, and the profile of aluminum are made by suppliers to Aston Martin, Jaguar and Volvo, and even four-wheel hydraulic disc brakes have. the Garia Soleil de Minuit Edition has features like a roof made of carbon fiber, special paint, leather seats are stitched by hand, and the Alcantara roof lining. 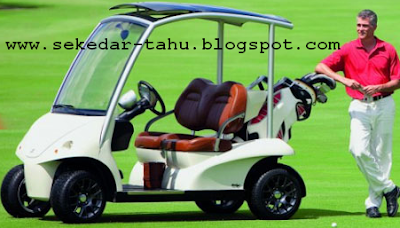 Garia starting price for the standard U.S. $ 17,499, it is not including shipping and tax.